As many of you may already be aware of, the xenophobic attacks that are taking place in South Africa have left many people speechless and in despair. The graphic images of human flesh that has been ripped apart to the bone, the few policemen with fire extinguishers trying to put out the flames from a live human being and the outrage that has been poured out through the media as well as social networks such as Twitter and Facebook have left many of us who are far removed from the situation, concerned. One can’t help but feel helpless when recently it was Kenya involved in a tragic incident where over 150 students who had been killed at a university. There is so much civil unrest in places that I call home. I am a Zimbabwean with South African heritage. My father was born and raised in South Africa and although I did not grow up there, I have lived there periodically and it is a place that I now call home because that is where my parents reside. In speaking to different people I have come to understand that many South Africans are still dealing with the issues that relate back to the apartheid era and the trauma many of them were subjected to. I can never fully understand their pain, disappointment and hurt over this issue. Regardless of whether what is happening now, with the xenophobic attacks, I do not think it’s fair to use the past as an excuse for present behavior. I do not think that it is fair to slaughter another human being in the face of young children and I certainly do not condone that all of this is happening because they feel threatened by foreigners who are supposedly “taking all their jobs”. 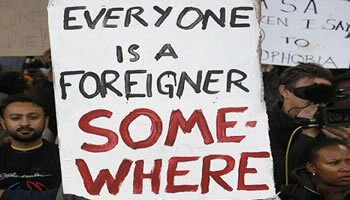 It is not a fair argument because anyone who has lived in a foreign country for reasons pertaining especially to employment and education knows that it is not always easy being accepted or landing yourself a decent job. You have to work for it, and you have to prove yourself to be twice as good as everybody else. You have to strive beyond the social norms to find your point of difference and to be heard by the locals. The employers need to know that you are hungry and that you are willing to work hard. They want to see why they should hire you instead of a local person. In most cases, many companies and countries will do whatever they can to hire local people first. For example in Australia you cannot just graduate as an international student from university and expect a job and you cannot just hop on a plane either expecting to get hired without going through a rigorous process. Most jobs require you to be a permanent resident or at least be in the process of obtaining one before they even consider your job application. As a foreigner, you have to work really hard to make a name for yourself. You literally have to hustle from nothing and build your way up to something. So when South African’s sit back and blame foreigners for taking their jobs, from my personal experiences and knowledge, I really fail to understand them. This is not to say that every foreigner is perfect and hardworking, but majority definitely are and so rightfully, they have earned the jobs they have and small business they have built. They have also earned the lifestyle they live and the right to do so freely without the fear of being attacked for trivial reasons. I would like to hear from anyone who knows more about the situation as I am yet to learn more about it, to better understand both South Africans and the victims involved or those who are affected by the xenophobic attacks.